State Rep. Bobby Guerra, D-McAllen, encourages people to vote in favor of Texas constitutional amendments labeled Proposition 1 and 6 in the upcoming November 7 election during a news conference Thursday October 19, 2017, at the Lark Community Center in McAllen. Both propositions would modify property tax rates for family members or either disable veterans or killed first responders. 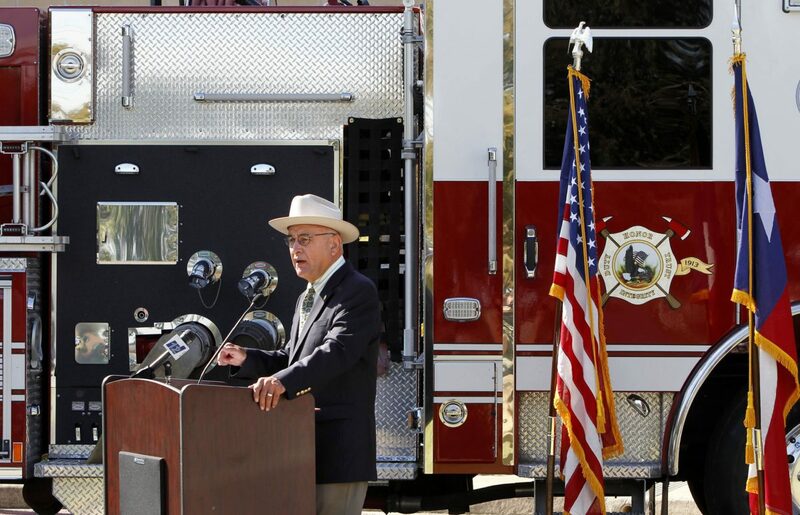 McALLEN — With first responders, city officials and other law enforcement in attendance, state Rep. Bobby Guerra urged voters to pass two Texas constitutional amendments he supported during this past legislative session. “Two of these measures I have supported and would like all voters to be aware of, and I think would have a tremendous impact on Texas and Texans,” Guerra said during a news conference on Thursday. Held in front of the Lark Community Center in McAllen, Guerra, who supports both Propositions 1 and 6, said at the news conference that he wanted to remind voters about the amendments that are designed to help veterans and first responders. Guerra said Proposition 1 will help correct an “oversight” so veterans who are partially disabled can receive a homestead exemption. This property tax exemption would be specific for veterans whose homes may have been donated in part through a charity group, with the other portion of the home paid for by the veteran himself. Currently, veterans who pay a partial amount on their donated home still have to pay property taxes on their property. Veterans who receive a fully donated home already receive the homestead exemption. “By supporting Prop 1, we will be able to correct this oversight, and ensure that these brave men and women receive the homestead exemption they so desperately deserve,” Guerra said. Speaking in support of the propositions was a local Army veteran, Master Sgt. Joe Salas of McAllen. Also in attendance was McAllen police Chief Victor Rodriguez, Hidalgo County Sheriff J.E. “Eddie” Guerra and McAllen Mayor Jim Darling. The state representative said it was important for him to make voters aware of the propositions because voters historically do not come out in big numbers during non-gubernatorial and non-presidential elections. Proposition 6 is designed to financially support the families of first responders, officers, firefighters and emergency medical technicians who die while on duty. Darling, who also supports the propositions, said he hoped voters would pass the amendments. Rodriguez called the proposition a “partial” benefit for the families of those first responders and all those classified as such — calling the move by Texas “a signal” that the legislature supports law enforcement. The Texas Secretary of State explains the following on its website for this proposition as well as for Propositions 2 through 5 as well as 7.